A local coalition of supporters from across the political spectrum in Oregon blasted Sen. Jeff Merkley’s change of heart on the Jordan Cove liquefied natural gas (LNG) export terminal in a series of statements and op-eds released late last week. The Oregon Democrat reversed his position on the Jordan Cove Energy Project last week in a letter to the Medford Mail Tribune. Merkley is Oregon’s only congressional member opposed to the project. The $8 billion dollar project would mean hundreds of permanent jobs and tens of millions in payments to Southern Oregon counties who have not recovered economically as quickly as other areas of the state, backers say. Merkley, basing his decision on opposition to “large-scale fossil fuel projects” like Jordan Cove, still admits that proceeding with the project “would create hundreds of good-paying construction jobs, strengthen union pension funds and train apprentices” while providing property tax revenues that would go to schools, as well as other infrastructure improvements. Timothy Frew, Executive Secretary for the Oregon State Building and Construction Trades Council, a key Democratic constituency, said the Oregonians he represents support the Jordan Cove project and the economic prosperity that will accompany it. “As the Executive Secretary of the Oregon Building Trades Council, I am privileged to represent over 30,000 Oregon construction workers belonging to 28 crafts. The men and women of the Building Trades are invigorated by the opportunities that the Jordan Cove LNG project will generate. In addition to the 2,100 family-wage construction jobs that will be created, it is estimated that more than 750 well-paying, permanent jobs will be added to Southern Oregon,” Frew wrote in a statement to legislators last week. “While the urban centers of our state have largely recovered from the economic recession, rural Oregon is still lagging behind. The Jordan Cove LNG project is the largest commercial venture in Oregon’s history, and it will bring prosperity and growth to the South Coast and beyond,” Frew continued. Frew acknowledged not only the economic benefits but the global needs for the fuel that would be delivered via Jordan Cove in an environmentally responsible manner. Frew applauded the project’s environmental review process, calling it “well vetted” by FERC and subject to Oregon’s own state regulations and permitting processes. Three Oregon county commissioners penned an op-ed critical of Merkley’s opposition to Jordan Cove, saying they were “deeply disappointed.” They echoed the economic and environmental benefits of the export terminal in Southern Oregon. “The Jordan Cove liquefied natural gas (LNG) terminal will provide U.S. allies in Asia with a cleaner form of energy while creating thousands of construction jobs and hundreds of permanent jobs in Southern Oregon and paying tens of millions of dollars in taxes to rural counties every year it operates,” wrote Klamath County Commissioner Derrick DeGroot, Douglas County Commissioner Tim Freeman, and Coos County Commissioner John Sweet. The commissioners estimated roughly $60 million in annual payments in lieu of taxes for the four Oregon counties for public services like schools and law enforcement. “Natural gas is a much cleaner alternative to coal without the risks associated with nuclear power. This is why countries such as Japan and South Korea want to purchase North American natural gas and Jordan Cove already has half of its output committed to Japanese buyers,” the commissioners wrote. In a bipartisan letter, two Democrats and four Republican legislators also urged approval. “Southern Oregon, and the South Coast region in particular, need the Jordan Cove project. Rural Oregon’s economic recovery from the great recession continues to lag far behind Portland and the Willamette Valley,” the legislators wrote. Senators Dennis Linthicum (R- Klamath Falls) and Arnie Roblan (D-Coos Bay) co-signed the letter along with Representatives Dallas Heard (R-Roseburg), Caddy McKeown (D-Coos Bay), Werner Reschke (R- Klamath Falls), and David Brock Smith (R-Port Orford). The creation of hundreds of jobs would, the legislators argued, bring economic benefit to the entire region. “This influx of people and capital into the region will stimulate existing businesses and attract new businesses, bringing additional indirect jobs and other economic benefits to the area. 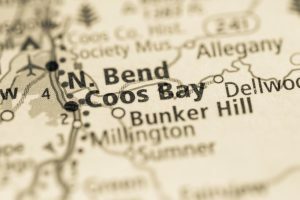 The project will also lead to improvements at the Port of Coos Bay – Oregon’s only deep-water port other than Portland – opening doors for other infrastructure investments in the port,” they wrote. The legislators compared the project’s “rare and exciting” prospects to a Silicon Valley-type investment for Oregon. “A $10 billion Intel-sized investment such as this will pay dividends to the region for a generation. The positive benefits of this project will ripple across Southern Oregon, and help revitalize a part of our beautiful state that has been economically stagnating for decades,” the legislators concluded. The project would have economic effects far beyond Southern Oregon, however, with support from land-locked oil and gas producing states further inland seeking pathways to international LNG markets. Colorado Governor John Hickenlooper has called for FERC to approve the project that would ship natural gas from Western states like Colorado and Wyoming to the terminal in Southern Oregon via the Ruby Pipeline. In 2016 he asked the commission to reverse its decision in a letter outlining the importance of the project to producers in his state. Jordan Cove “represents an important new source of demand for natural gas producers in Colorado. It is important for shippers and domestic natural gas producers to continue to access markets for natural gas including the Asian Pacific countries which comprise the fastest growing liquefied natural gas (LNG) market in the world,” Hickenlooper wrote. “In denying the Project, FERC will not only be denying the positive economic benefits to the development areas, it will also be denying the far reaching benefits beyond the Pacific Northwest. As I’ve previously highlighted, the project terminal is the only facility on the west coast that would directly link Colorado to new energy markets via the Ruby Pipeline,” Hickenlooper continued. 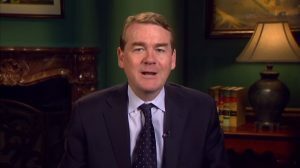 U.S. Sen. Michael Bennet (D) and Sen. Cory Gardner (R) both support the project, as do elected officials across Colorado’s oil and gas producing Western Slope. Gardner told attendees at the Colorado Oil and Gas energy summit in August that Jordan Cove was critical to Colorado’s natural gas market. “We’ve got a lot of work to do to make sure that places like LNG exports [facilities], Jordan Cove and others, are open so that we can start moving these products from Colorado to around the globe,” Gardner said. Gardner and Bennet joined a bipartisan letter co-signed by 13 other Western state elected officials in calling for a FERC rehearing for the Jordan Cove project. “Natural gas production serves as a foundation to the economies of Rocky Mountain states, including Colorado, Utah, and Wyoming, and Indian tribes, including the Ute Indian Tribe and the Southern Ute Indian Tribe,” the legislators wrote. We applaud FERC’s permitting of LNG export terminals and related facilities along the east coast and Gulf of Mexico. However, it is critical that FERC make every effort to allow Rocky Mountain states and Indian tribes to access overseas markets,” they wrote. Senators John Barrasso (R-Wyo. ), Mike Enzi (R-Wyo. ), Orrin Hatch (R-Utah), and Mike Lee (R-Utah) were accompanied by Representatives Cynthia Lummis (R-Wyo. ), Scott Tipton (R-Colo.), Doug Lamborn (R-Colo.), Mike Coffman (R-Colo.), Rob Bishop (R-Utah), Chris Stewart (R-Utah), Jason Chaffetz (R-Utah), Ken Buck (R-Colo.), and Mia Love (R-Utah) on the letter. In 2016, the U.S. Geological Survey revised its estimates of natural gas in Western Colorado. The agency said new research revealed that the area held 40 times more natural gas reserves than previously thought.